What the f*c* you think are you? The time of the attack will be at 18:00 in-game or in spain. If any of the participants, whether from Corloene, DW or C.R.C use any hack or crash the server stay completely clan or clans as losely and won the contrary. C.R.C wont be taking police station cuz i dont like it. If Corleones has anything against this they can post in this topic, i will answer. Hi Neo, sorrt but you can't. When I leave LU ( voluntarily and because I was bored LU since there was nothing else I wanted to conquer or no enemy to fight ) i give to pedigreedjet and to TW clan all my territories, and one thing more, if you try to steal that territories to the TW clan, i will be return to LU, and now without friendship with your clan, and not with Corleone, only like a support for TW, like a sub leader. TW people never plays around, and you havent done any official message about that in tw topic too. 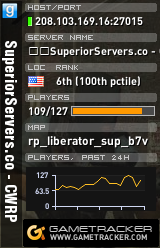 I just want to inform that C.R.C is still alive, were just having hard time to show up and organize because a lot known servers has gone down... like lolmor, cz, mess about. its really hard get new members because players doesn't seem to stay in lu that long anymore. and only ones who do stay are already old playes who are not interested in clans anymore. hard times there are but they wont bring C.R.C down yet. C.R.C Empire is recruiting and searching for members! its my clan, no one elses, i need everyone's help to stop this fake clan. MAKE C.R.C GREAT AGAIN, fight against the rebellion! If you will Report Vrocker That will banned the server Of kewun And Kevin he do a fake [C.R.C] don't worry Vrocker Fix this!! !